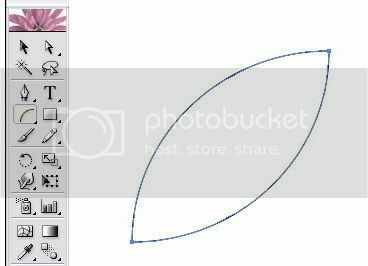 About two weeks ago, I’ve made a set of floral Photoshop brushes that has some kind of bend or twirl ribbon effect in it. I got respons on flickr asking me of how I made the effect. 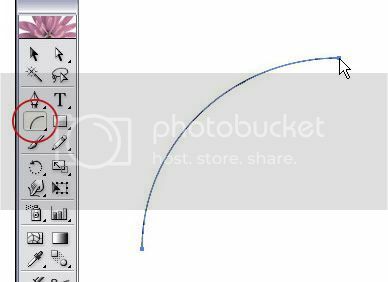 And draw another curve next to the first curve that you made. Remember: do not group those two paths because if you group it, you won’t find a nice blend effect as this tutorial will show you in the finish result. You can fill the Specified Steps with 10 or more. 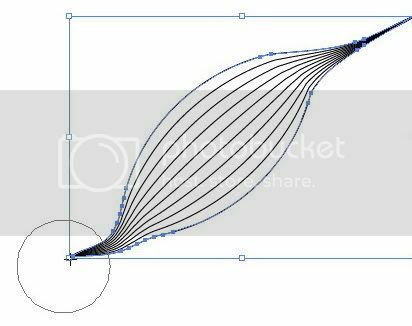 Just to let you know that the more you add the number of density of the specified step then you would create more dense curve lines. Don’t forget to set the orientation of the blend as align to path. 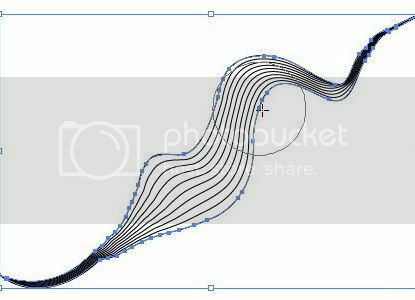 Step 3 – Creating a nice ribbon using warp tool. As you can see, we still manage the both edge. Now we try to tweak the center curve lines. Still using the warp tool, do it exactly as I told you in the previous step but now be focused on the center curves only. Q: JustCreativeDesign.com is your new blog which I think is quite a success. How can you manage your time as a student and as a graphic designer and a blogger at the same time? JC: It comes quite naturally as I am very good at multi tasking. You will usually find me designing and blogging at the same time (probably along with another 15 or so tabs open in Firefox). Also it comes down to me just loving what I do so time just flies by. My typical day would be me waking up at 9 or 10, then getting to bed at 12 or 1am so I do make the most of my time. Q: You describe yourself as an enthusiastic, sceptical, eloquent and a focused person. When u meet a new client, or are in the middle of designing process, how far do those attitudes help you out? JC: Well being passionate and enthusiastic is a bonus within any industry and I suppose having these qualities helps build up trust within the client which is an important aspect in this business. Q: How did you get started in design or how long have you been doing it for? JC: I got started in design when I was 12 when I put my first website on the web for my local basketball team. It consisted of lots of animated gifs and cool graphics, quite embarrassing really. That was my first taste of design then when I was 15 I started running a website called PartyPhotos for my school friends showcasing photographs from the weekend (this was before Myspace or Facebook). Ever since then I got hooked on graphics and couldn't stop designing. Q: What kind of project will always be your favourite? JC: To be honest I love the university projects that I receive as I get total freedom and can be very creative but I suppose this will change when I graduate next year. What will happen then, who knows? Q: A designer can stand out with an idealistic idea or go with the flow as the client said. How do you see yourself in this dilemmatic situation? JC: It all comes down to communicating with the client on what would be the best decision and you would look at the best options and weigh out the positive VS the negative. Q: Do you use any special techniques and tools, such as a tablet, or is it mainly the mouse doing all the work? JC: Mainly my imagination, an A3 Sketch Pad, a pencil and my mouse. A graphics tablet is on my Christmas wish list though. Q: When you write an article for your blog, do you think there is a certain trend among your readers to read different sorts of resources on the internet rather than professional tips or a discussion topic? JC: Well as far as I know I have a pretty unique blog as I write up about personal university projects as well as providing tips and other resources from the perspective of a graphic design student. I don't know of any other blogs that do this so I suppose there is no specific trend in my niche. Q: What is your favourite music and movie genre? JC: Definitely electronic dance music. Some of my favourites are The Presets, Pnau, any compilation from Ministry of Sound and a trillion other different djs both local and international. But in saying this, I also dive into many other areas of music tastes... which would be proven by my 41gb of music (7750+songs). My favourite movie genre is probably the big blockbusters with all of their awesome special effects but I also like a good thriller. Q: If you have a chance to express your skill for a personal design portfolio, how is it going to look like? I mean, you can tell us what kind of design style that you're going to use the most? JC: I don't tie myself down to one particular style. If you have seen my work you will notice that they are all so different which is how I would like to be seen ... that being versatile. Q: The last question, what are your other main hobbies when you're not designing? Well to be honest that is my main hobby if you can call it that but other than that I really like just being around my mates. It's a guaranteed good time if I am around them. JC: I also go to the beach quite a bit, and I go out clubbing probably twice a week and I go to a lot of festivals and dance concerts. I used to play sport however this year I wanted to focus more on design. I also go cruising / fishing on our boat every month or so. 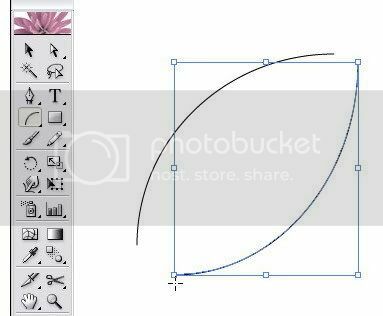 I've been busy with some blogging activity events, now I'm coming back again with another vector Photoshop brush set to download for free. I have added the 4th Fantasy Floral Photoshop Brush set series until now. There are 3 variations for you to choose and I was experimenting with multiple layered curves lines. 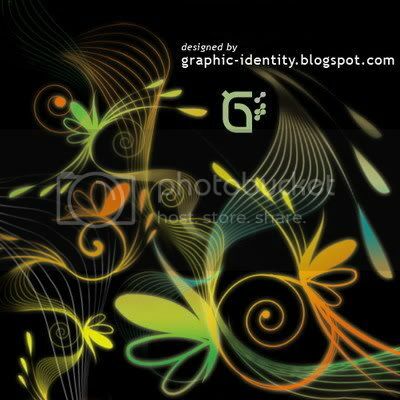 I'm not sure of how to distinguish the type of these photoshop floral brush style... I guess you are free to comment on this post to figure out what it is. Some comments lead me to give you quick tips to optimize the use of Graphic Identity Floral Photoshop Brush set series pack. My brush collections are actually so simple in shape... but if you want to give dramatic effect, I suggest you to use multiple layers for different size brush tip. This would make easy when you want to put different style of gradients, oppacity, or glowing FX and oppacity for the each layers. Another thing is to apply free transforming to it, such as rotating and fliping to have more variation of shapes. Each of brush is categorized as high-res in size (1600px - 2300px). Again, I would like to remind you that all of my 'Free Design Box' files are FREE (for personal or commercial use). But after I found that my previous Photoshop brushes set were hijacked by someone else, please read: Legal Usage to employ Graphic Identity's 'Free Design Box' files. 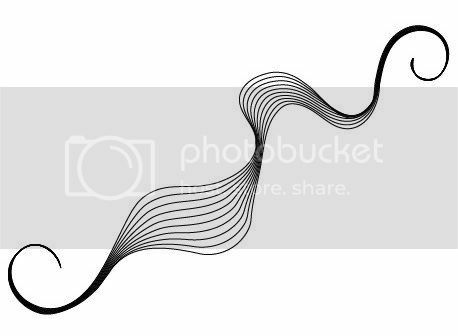 If you wanna know how I created this type of brush set, please visit this Illustrator tutorial: How to Create a Ribbon Using Blend Effect in Illustrator. I love your feedback, and that's why these free design box files now has a plain .ABR file to download directly...I also included compressed .ZIP file instead of .RAR. file so you can unzip the smaller size file or extract the file later if you need it. (You must have WinZIP or WinRAR software installed to your computer for that). Graphic Identity has been invited for a cross interviewing event between Design Bloggers held by Estetica Graphic Design Forum. 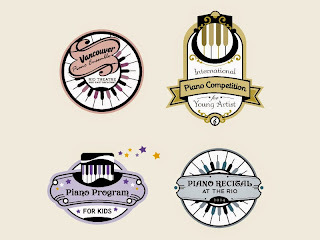 and at the same Graphic Identity Blog will also be interviewed by Caroline Murphy of Caroline Murphy's Designs. The final interviews will be posted on Graphic Identity blog as all the interviewed participants will do the same thing next week. If somehow you get courious of how this interviewing round up will be published later on, you can subscribe to Graphic Identity Blog to follow the next update. Since blogging brings a huge phenomenon to the internet world and for our inspirational thoughts, starting by this weekend and ahead, Graphic Identity will publish Weekly Blogroll Links that are consist of great article links on various topics. Abhinav Sood is a Meta Blogging blog author, and he has wrote lots of great blog reviews. More than a week ago, I wrote a guest blog post at InspirationBit.com. That was my very first guest blog post, and I was so happy that Vivien (the author of Inspiration Bit) gave me such a wonderful opportunity to contribute something on her blog. I've included some photos of Graffiti Walls at my neighborhood, and I think it was a fun small research that I'd like to share with you since generally I believe there are some connections between those graffiti art and the local social culture. This tutorial will show you how to use CSS to create rollover image buttons/menus using relative position. There maybe some other ways to create the same rollover effect. I’ve learnt about this from Veerle’s old post about Div thinking cap. I wasn’t realizing of how important this technique for my design until I had a project that required me to create uneven (unordered) menu placement with lots of motive texture as the background. If you get interested or you even still don’t get me :p , please have a look to the demo webpage. And let’s have fun with this tutorial! Create a master background using Photoshop, Be creative as your background design can be part of header, sidebar decoration, search box or any part in your website. My example here is simple :D I just want to show how these random positions of buttons / icons are possible to be done with CSS relative position techniques. 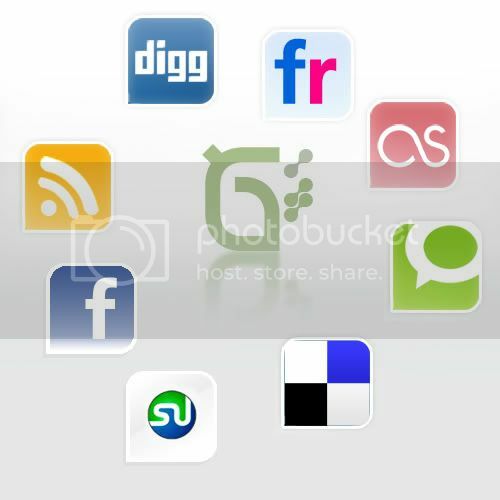 The icons that I’ve used for the design are Social networking icons created by FreakGroup.com.ar. They are very nice icons with smooth gradients FX on each of it. The Facebook and Stumble Upon icons are not included in the download pack; because of it I have designed them with the same style as what in the pack. After you finish, save the file both in .JPG and .PSD then duplicate the .PSD as a new file. The next thing to do is to crop the image of button or icon that you wish to have rollover FX on it. After that, merge the layers down. NOTE: I think .PSD saved format will help a lot if you need any changes to the layout or the icons. So consider to always save the master background in .PSD file as backup. You will need to put on a note about the precise image size of your cropped icon. In this case, the size was 92px x 92 px. 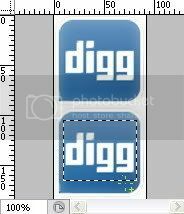 Create a new file with the exact width (92 px) of icon size but put it doubled for the height, that is 184px. 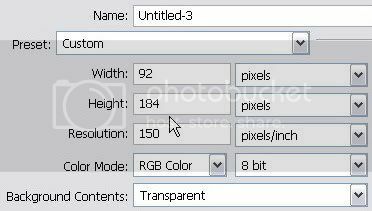 Make sure that you always create a new file with the same image resolution as the first image background. Go back to the cropped icons file and duplicate the background layer. Then drag to the new empty file that you’ve just made. Show the smart guides by entering menu: View > Show > Smart Guides. Place the icons layer on the top of the empty file. The smart guides will show the exact alignment as you can see red thin line appeared if your icon layer edge hit the image border. Duplicate the icon layer to have another same icon image and place the second copied layer to the bottom side. 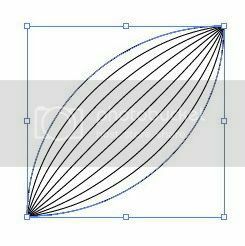 Below is an illustration of the precise layers placement. 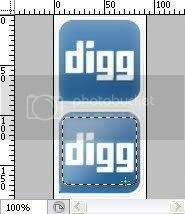 Work on the bottom icon layer, and create selection using Rectangular Marquee Tool. Go to the menu Select > Feather (Alt + Ctrl + D) and fill the Feather Selection Radius for 3px. Be sure that Dither and Transparency box are checked. Drag your cursor into the selected area until you get the nice gradient effect as you desire. 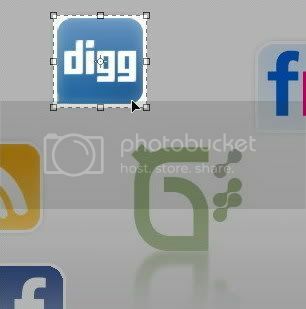 Save the file as .GIF file and do the same with the rest of the icons (begins from the Step 2). NOTE: You can create rollover state effect with your own creativity. If you have unrasterized fonts on your button or icon, you can change the color of the font and styles to differentiate it from default state. The relative positioning in this CSS technique should be better applied than absolute positioning. Because absolute position would make the icons stays at a certain location even when the window resized. In order to get the top and left coordinate’s position value just like the Icon’s CSS above; you will need to experiment with numbers. This process is quite alike to a puzzle game actually :D. I suggest that you can start with the range of 100px for both top and left positions and see how it looks on the layout after you save the CSS settings. After that try to decrease or increase the position value for each position. Resave the file and reload or (ctrl + R) your browser to do the position check. Do it for several times and by this time, you should notice how much exactly the numbers of value to be added until you get the nice position of the icon as the master background shows. Sometimes you may go with negative value as well to fit your icons to master background. :D Crafty but it works! Do the same step 2 and step 3 with the other icons.